incredible features. A perfect companion at playful camping or breezy outdoors, this multi-functional, splash-proof and durable set keeps you tuned in to your favorite sports talk shows, newscasts or a music station’s program of your choice. OR you can just rock with your own selections using iPod or a smartphone, simply by pairing up using its 3.0 Bluetooth. QUALITY SOUND, RECHARGEABLE BATTERY & WATERPROOF DESIGN – This IPX7 rated waterproof and sturdy set comes with ultimate stereo speaker crystal sound technology and offers incredible sound quality at less than 1% Harmonic distortion - ensures a tighter bass and more overall clarity when compared to similar other speakers. Moreover, its rechargeable lithium-ion battery provides a long lasting power backup of 6-8 hours once charged fully. EASY TO USE WITH BLUETOOTH AND BUILT-IN MICROPHONE: No more tangled cables! With its 3.0 Bluetooth technology, you can connect any device instantaneously and listen to any of the selections using your Bluetooth equipped smartphone, iPod or even using any other NFC capable device. Also, its in built microphone makes it convenient for you to answer your phone calls in a handsfree manner. LCD DISPLAY WITH DIGITAL CLOCK – It features a 1.33 inch backlight LCD display having 24 hour notation digital clock. Along with currently running FM station, the display provides useful information about battery charge and volume. With a powerful 3.93” suction cup at the base, it can easily be sticked to any flat and clean surface, and holds on firmly to avoid any risk of it slipping or falling down. 100% RISK-FREE SATISFACTION GUARANTEE – Our product comes with a 100% risk free satisfaction guarantee to let you buy with confidence; no questions asked. 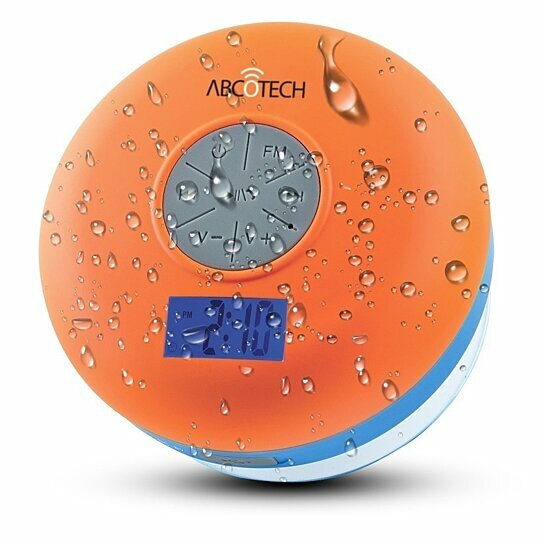 However, we are quite sure that you will be super impressed by the waterproof design that lets you play music in the shower, at the pool, while you enjoy your time at the beach or on the boat, its sound quality, powerful and rechargeable battery (USB charging), and will love yourselves for the decision of buying it.